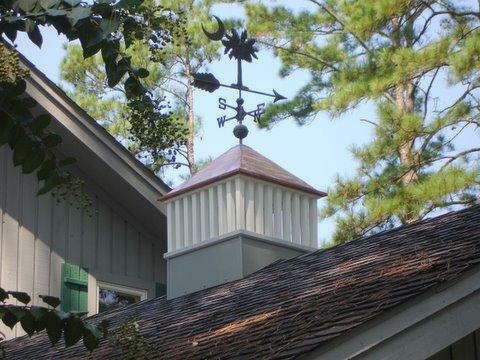 This beautiful cupola roof was made by Larry at his home on Callawassie Island, South Carolina. Click on the photo above for a larger image! The 28 inch square cupola was made from materials he had in his garage. It is lighted and has a plexiglas wall inside the body posts to keep the water out. It is wired through the roof to the nearby attic outlet which has an on/off switch in the garage. The cupola was constucted from three pieces: base (pressure treated plywood), body (pressure treated 2X2 inch posts), and the roof, and is easily disassembled with screws. It stands about 3 feet tall without the vane. The vane is from a former cupola that had seen better days.